Here we share with you 4 best ways to transfer songs from Mac to iPhone 7 with and without iTunes from Mac/iMac/Macbook/Macbook Air/Mac Pro to iPhone 7/6s/6/5s/5 etc. What are the iPhone 7 pros compared with older iPhone 6s/SE/6? Much larger internal memory space counts for much. As iPhone 7 is shipping with at least 32GB base storage, music lovers can move greater amount of songs to iPhone 7 to build a more complete personal music library. But, the common problem is how to transfer songs that are obtained from other free online sources like YouTube/VEVO/SoundCloud/Audiomack to iPhone 7 instead of purchasing in iTunes and Apple Music? Follow the guide to get a clue about transferring music songs from Mac to iPhone 7. MacX MediaTrans is the best alternative to iTunes to bulk export music from Mac to iPhone 7/iPhone 8 at full speed. Also it's an all-round music manager to create music playlist, bulk delete songs, edit artist info, make any song iPhone ringtone, etc. 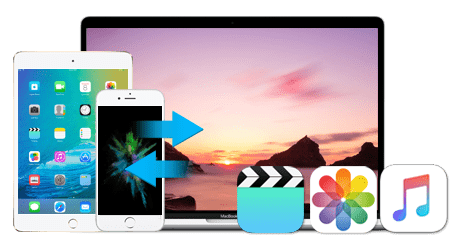 How to Transfer Music from Mac to iPhone 7/8/iPhone X with MacX MediaTrans? The top reason why we recommend MacX MediaTrans as the first choice is in concern with your convenience. You've got nothing to worry about aside from choosing the target songs. The whole process will be done like mad at about 60M/s – quickest choice of all. Batch editing music info, batch songs/ID3 tags transfer, creating playlists are all supported by this easy to use iOS music transfer. Unlike iTunes, nothing would be erased/replaced during syncing and you can transfer music to iPhone 8/7s/7, as well as ringtones, eBooks, videos, photos, too. Before everything, you're required to free download this top iPhone 7 transfer on Mac or PC first. Then fire it up. Click Music Manager on main UI and give a hit on "Add Music" on the upper side bar to sync music from Mac to iPhone music transfer. 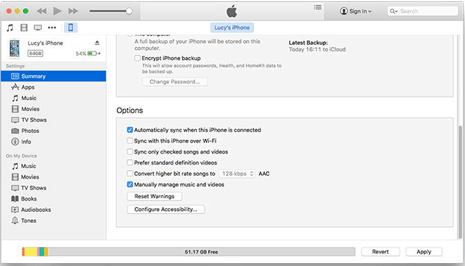 Click sync to start syncing music from Mac to iPhone 7. The Sync feature makes your iPhone 7 stay the same with Mac files (selected ones). As a medium of music transfer between Mac and iPhone 7, MediaTrans also allows you to move songs, playlist from iPhone 7 to Mac, as well. Certainly, you can also make full use of this iPhone transfer to manage iPhone music library, including creating music playlists on iPhone 7, delete unwanted songs from iPhone 7, batch edit music info, etc. to get iPhone songs in perfect order. How to Export Music from Mac to iPhone 7/8/iPhone X Wirelessly via AirDrop? 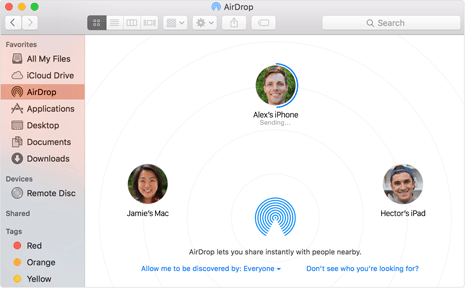 Airdrop is the built-in free function for devices in apple ecosystem. This method can help you put music to iPhone 7/Plus from MacBook Pro/Air or iMac without cable free. 1. Open Finder on Mac and click AirDrop. 2. Swipe up from the bottom of your iPhone 7 and tap AirDrop>Everyone. Mac AirDrop will soon discover your iPhone 7 presenting with your image. 3. Drag and drop songs, ringtones, and voice memos to the image. Mac to iPhone 7 music transfer alert will remind you decline or accept the transfer. 4. Click Accept to migrate music from Mac to iPhone 7. However, all the songs transferred to iPhone 7 via AirDrop are not allowed to be imported in Apple Music app. Though you can use 3rd party apps to store and open the music files with, like Evernote and FileManager, those songs are doomed to be scattered around and you cannot manage them from one single app. How to Transfer Songs from Mac to iPhone 7/8/X Using Anytrans? Anytrans is another Mac to iPhone 7 music syncing tool you can try. Similar to MacX MediaTrans but it is a bit more expensive - $39.99. Step 1. Download and run AnyTrans on your computer, and connect your iPhone to your Mac via a USB cable. Step 2. On the main UI of AnyTrans > Click "Audio" > Select "Music". Step 3. Click the "+" button on the upper-right of the interface. Step 4. 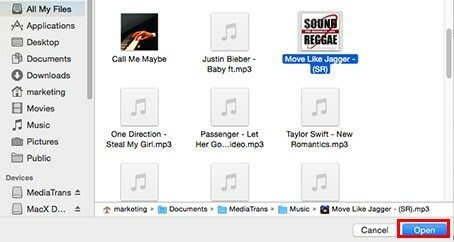 Browse the songs on your Mac. Step 5. Choose the song you need and click the "Open" button to copy songs from Mac to iPhone 7. How to Move Music from Mac to iPhone 7/8/X with iTunes? iTunes can not support you to directly transfer music from iPhone 7 to iTunes, but it doesn't mean there is no way to do so. If the songs are purchased from iTunes store on your Mac, you can transfer them to your iPhone 7, iPod, iPad with Apple ID whenever you want. Just open iTunes store app on your iPhone 7 and tap more>purchased>music and then tap "Not on This iPhone" to redownload purchased songs from Mac to iPhone 7. 4. Sync iTunes music library with your iPhone 7. Note: You can drag and drop one or more songs from iTunes to iPhone 7 directly. Be aware of the hidden traps of "Sync" you might fall into, in which cases all your songs in iPhone 7 will be washed up by iTunes music library. 1. Before Mac to iPhone 7 music syncing, go to your iPhone 7 connected iTunes and click Device>Music to set "Sync Music" option as selected playlist/artist/albums/genres instead of Entire Music Library. 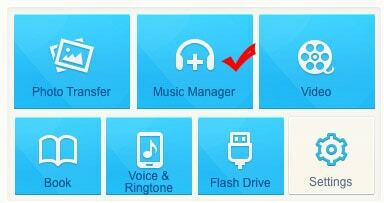 Then choose the target music playlist/artist/album/genre and click Apply to confirm the settings. After that, you can click sync and iTunes will start syncing music from Mac to iPhone 7 right away. This setting prevents your whole iPhone music being synced by iTunes and let you select certain songs to be moved from Mac to iPhone 7. Apple has taken these drawbacks of iTunes into consideration by offering $24.99/year iTunes Match subscription limited to 10 devices. Music imported from a CD or other source will be covered in iCloud storage also. Note: To transfer music from Mac to iPhone 7 wirelessly without cable using iTunes, you can go to iPhone>summery and check sync with this iPhone over WIFI. Transfer songs from Mac to iPhone 7 top 4 ways are given above. Choose any of them as you see fit or test them using their free trial versions first. MacX MediaTrans guarantees you best experience transferring melodies from Mac to iPhone 7/6/5/4 iPad/iPod and even lets you turn the available iPhone 7 storage into a USB flash drive for free so that you can take whatever files/PDF/ZIP along with you. iTunes is a headache! Ditch away the annoying unfriendly iTunes 12.5/4.3, try on the best iTunes alternative to super fast export music from Mac to iPhone 7 in batch. 20 music songs export from Mac to iPhone 7 only 3 seconds!! !